Remember when mixing metals was considered a fashion don’t? We’re eternally grateful that this antiquated rule no longer applies to jewelry or home décor, and that there are many beautiful metals to choose from when it comes to bridal jewelry. The metal you select for your engagement ring will be with you forever, and the choice is as deeply personal as the cut of your diamond. Romantic rose gold, timeless yellow gold, bright white gold, impeccable platinum – there’s a metal that’s right for everyone, and each tells a story about your personal style. In the last few years, we’ve seen a major uptick in the demand for delicate rose gold. From luxe smartphone cases to the most avant-garde fashion houses, this blushing beauty has been everywhere. The metal’s appeal is understandable: rose gold casts a warm, romantic, and universally flattering glow, perfect for showcasing a diamond. It is understated but at the same time eclectic, and a very deliberate choice. 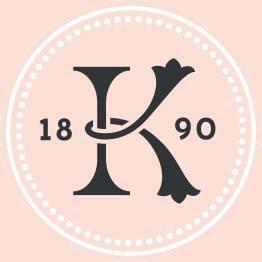 When you choose rose gold, you’re sending the message that you’re a traditional romantic at heart. At the same time, you’re celebrating the style-conscious fashionista within. 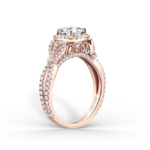 Check out our collection of dreamy rose gold engagement rings and prepare to swoon! When we think of traditional jewels, we almost always envision bold yellow gold. And what’s not to love? Gold is a mainstay in the world of luxury goods and has major retro appeal. Not only is its brilliant warmth inherently beautiful, but it creates a lovely contrast to the whiteness of diamonds. While traditional in nature, yellow gold is fast becoming the metal of choice for today’s more unconventional brides. When you choose this gilded metal, you show that you are not a blind follower of trends. Yellow gold says you’re a vintage lover with a thoroughly modern vibe. Our timeless yellow gold engagement rings offer the perfect balance of the past married with the present. A mainstay in engagement settings, white gold has a decidedly clean, unfussy aesthetic and makes a lovely backdrop for diamonds and gemstones alike. It has the classic appeal of gold, but with a modernized twist. White gold can acquire a slight yellowish tinge with age, but this can easily be re-plated, and some people actually prefer the warmth. 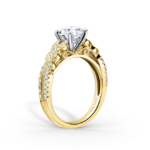 It is a tremendously popular choice in engagement ring designs and pairs beautifully with other shades of gold for those who like an eclectic look. If you prefer white gold, you’re a new traditionalist. You’re a little bit modern and a little bit classic, but prefer to be under the radar. Our beautiful white gold designs are the very definition of understated beauty, perfect for the modern classic bride. Platinum is a gorgeous white metal with a grayish undertone that will patina over time. 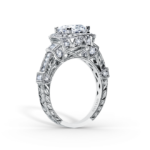 It is ubiquitous in engagement ring designs with good reason: it creates a clean, contemporary backdrop that literally goes with anything, style-wise. Those who select platinum are modern minimalists. Much like stainless steel appliances do in kitchens, platinum adds sleekness to bridal jewelry. Choosing this bright white metal says that your style is contemporary, but still glamorous. Take a peek at our gorgeous platinum engagement rings and read more about this ultra-popular metal here. Can’t pick one? (We agree, they’re all beautiful!) 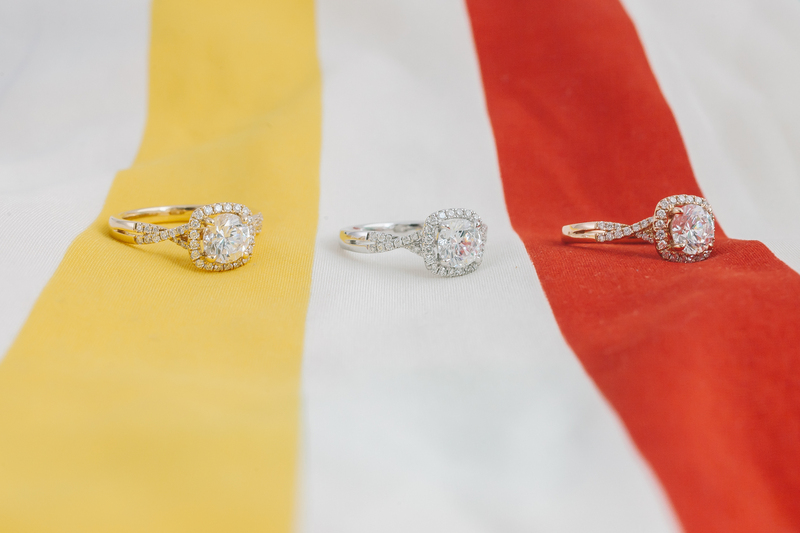 There’s no golden rule that your engagement ring and wedding band metal colors must match. In general, we don’t recommend wearing platinum against any type of gold because scratching might occur, especially on engraved rings. However, you can mix different shades of gold without issue to create an eclectic, inspired look for your wedding set. 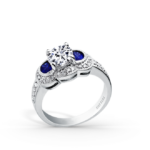 There’s also always the option of choosing a stunning two-toned engagement ring, which would reflect different sides of your personality and make mixing in multiple colored bands even more seamless. For four generations, we’ve been passionate about incorporating all precious metals into our award-winning designs. We especially love the uniqueness and variety that each one brings. The same ring can take on a completely different look depending on the metal you choose, and we find that pretty awe-inspiring! Our motto, however, has always been this: Wear what you love and stay true to yourself, because when you honor your authentic self, you simply cannot go wrong.